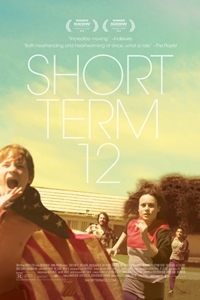 In Dante’s Inferno, the sign over the gates of Hell reads, “Abandon all hope ye who enter here.” If there were a similar sign over the doors of the short-term foster-care facility depicted in writer-director Destin Cretton’s Short Term 12, it would read, “Everybody’s broken and nothing lasts forever.” Still on the downbeat side, but much more hopeful — and helpful. What gives Grace’s very personal and under-some-circumstances ordinary story a broader depth and resonance is the way her struggles are mirrored in the lives of those in her care. She is terrified of moving into a new stage of life, full of increased responsibility and even more increased risk. We see that same terror in Marcus, a young black man about to age out of the under-18 facility. (His quietly enraged and accusatory rap, performed for Mason after a violent outburst, is possibly the most moving moment in a movie full of them.) And why is Grace terrified? Because she’s got Daddy issues — just like new arrival Jayden. Everybody may be broken, says Short Term 12, but in the best-case scenario, mutual wounds can lead to mutual healing. Cretton knows that his subject matter is tough, and so he leavens the drama with bits of broad humor — a clumsy new employee announcing to the group that he’s always wanted to work with underprivileged kids, a breakout attempt aided by a superhero cape. But mostly, he lets his characters be people, albeit extreme people. (You believe it when Jayden’s cool and uncaring exterior gives way to shrieking, destructive rage.) And if his ending feels maybe a tad too hopeful — well, he’s already put Grace & Co. through a kind of hell, and like the sign says, nothing lasts forever. Brie Larson heads a remarkably assured cast as Grace, and Cretton does a fine job with dialogue that could easily have strayed into inspiration-speak and melodrama. I do wish his camera had been as steady as his storytelling, but I’ll let Mr. Marks take that up in the interview. Sept. 11, 2013 @ 11:54 a.m. I've heard that Dante's "Inferno" is the prime reason people believe that Hell is in one place. Sept. 11, 2013 @ 11:58 p.m.
You must be thinking of the Spencer Tracy version.